Researchers at Cold Spring Harbor Laboratory say they have discovered a mechanism that could lead to a drug that only affects the cells and neurons involved in the treatment of strokes and seizures without unwanted side effects. “We suddenly get more glutamate all over the place that hits the N-methyl-D-aspartate (NMDA) receptor and that causes the NMDA receptor to start firing quite a lot,” explained Furukawa, who oversaw the study (“Structural elements of a pH-sensitive inhibitor binding site in NMDA receptors”), which appeared recently in Nature Communications. “Context-dependent inhibition of NMDA receptors has important therapeutic implications for the treatment of neurological diseases that are associated with altered neuronal firing and signaling. This is especially true in stroke, where the proton concentration in the afflicted area can increase by an order of magnitude. A class of allosteric inhibitors, the 93-series, shows greater potency against GluN1-GluN2B NMDA receptors in such low pH environments, allowing targeted therapy only within the ischemic region,” wrote the investigators. In a healthy brain, the NMDA receptor is responsible for controlling the flow of ions in and out of a neuron. The “firing” of these signals is crucial for learning and memory formation. However, overactive neurons can lead to disastrous consequences. Abnormal NMDA receptor activities have been observed in various neurological diseases and disorders, such as stroke, seizure, depression, and Alzheimer’s disease, and in individuals born with genetic mutations. Furukawa’s team, in collaboration with scientists at Emory University, looked for a way to prevent over-firing NMDA receptors without affecting normal regions of the brain. However, the 93-series compounds sometimes cause the unwanted consequence of inhibiting the NMDA receptors in healthy parts of the brain. That’s why Furukawa and his colleagues set out to determine how they could improve upon the unique features of the 93-series. 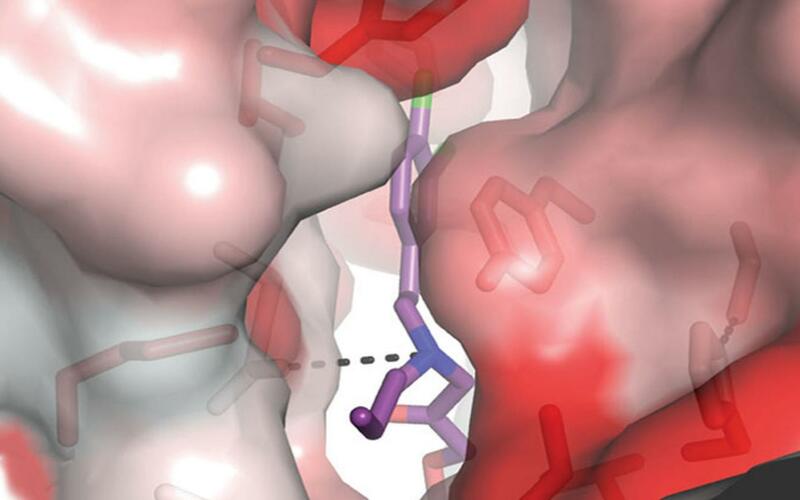 Using x-ray crystallography, the researchers were able to see that a motif on the 93-series compound slots into a tiny, never-before-noticed pocket within the NMDA receptor. Experimentation showed that this pocket is particularly sensitive to the pH around it.